For 6 million years the Colorado River flowed from high in the Rocky Mountains all the way to the Sea of Cortez. But since 1960 it has not regularly flowed to its delta, drying up before it reaches its final destination. After the completion of the Hoover Dam in 1936, and the Glen Canyon Dam in 1963 water rarely makes it past the Morales Dam, the last diversion on the river, since every last drop has been allocated and diverted away. 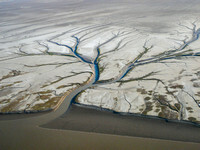 The Colorado River Delta was once a thriving ecosystem covering two million acres, a wetland teeming with wildlife supporting an economy based on tourism, hunting, sport and commercial fishing, one of the world’s most productive fisheries. All that dried up along with the overburdened and overworked river – now instead it is the lifeline for over 30 million people in seven states and two countries. 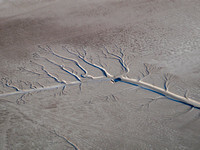 Now, thanks to a recent agreement between the US and Mexico, the last 70 miles of the Colorado River are getting a gush of water, or “pulse flow” during the Spring of 2014, in an effort to revive the dried up Delta. 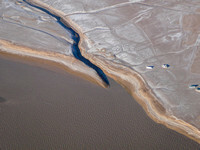 This is the first time in history that water has been sent to the Delta in the name of conservation. The 8-week surge of water is meant to mimic a natural flood, and bring life back to the parched ecosystem. Scientists will continue to monitor the flow’s impacts on salinity, seed dispersal, vegetation growth and fish and wildlife habitat. The agreement, known as Minute 319, allows Mexico to store water in Lake Mead and calls on both countries to share the benefits of water surpluses along with the burdens of water shortages, and to cooperate on restoration of the river’s ecosystems. EcoFlight joined in the excitement and celebration of this historic event at the Delta, attending the celebrations with US and Mexican dignitaries, and provided flights for National Geographic and PBS to document the flow.